I promised I would write about the new network topology I realised by using my brand new wireless router. 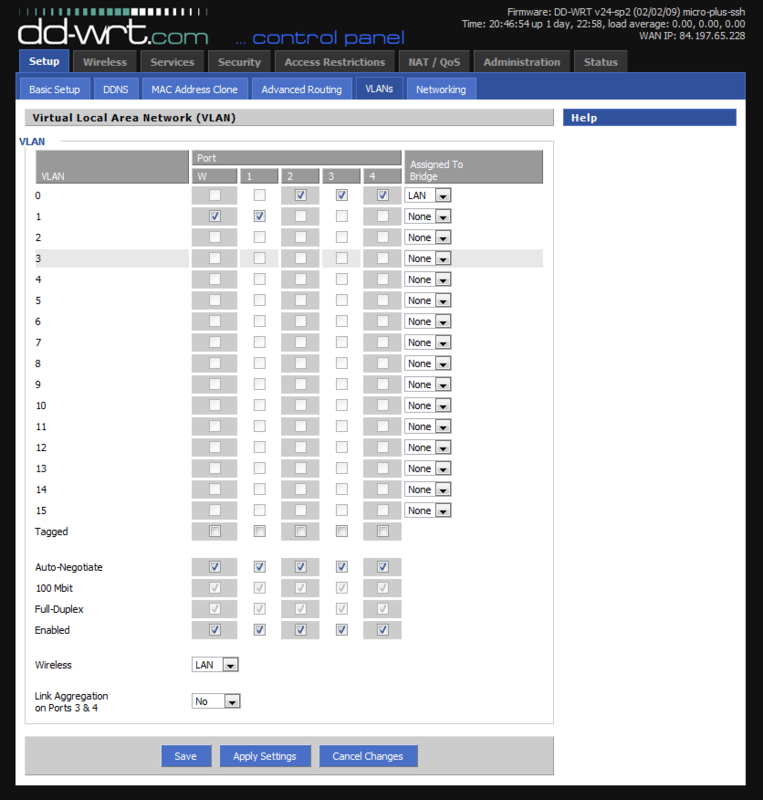 I installed DD-WRT on my new linksys WRT54G2. Now I will show how to configure it, so you don’t need an extra switch in a common telenet configuration.Â First I will describe the old situation and explain why it is done that way. Next I will describe how I managed toÂ get the same result, using just one device and a bit of configuration magic. So what is the old situation? Old situation with separate switch and router. The blue lines are COAX cable, the green one is scart/hdmi, the purple ones are UTP (network) cables. This is how telenet installs it. They provide an extra hub, to split the connection between the digibox / digicorder and the internet connection. It is necessary for the digibox/digicorder to work, that it can get an external (telenet-internal) ip address from a dedicated range (10.169.*.*). If the hub or switch would be removed, and the digibox/digicorder plugged into the router, it would get a private ip (192.168.1. *), from the routers lan-dhcp range. This is because the usual configuration of cheap router, does not allow to the split its switch-interface between internal and external ranges. It has one fixed WAN (wide area network) port, and the other ports are for the private network. This is my current setup. It’s almost the same, but now without a separate device for giving the digibox/digicorder its dedicated external ip address. It is now done using some configuration magic. I used one of the fixed internal network ports to form a WAN-switch. This can be done by configuring a VLAN where this interface, and the WAN port are combined, which leaves me with only 3 internal fixed network ports. This is enough for me. One for my fixed computer, one for my XBOX360, and I even have on left unused. My other computers are connected to my private network using Wifi. Click the image to get the full size. Â The result is the same as if you would have the extra physical switch in between, only now, it is implemented as a “virtual” switch inside the router. You only need one device, where you used to have two. This saves a UTP cable, a wall-plug, the space to put the switch and lots of energy (= money). I have not calculated how much energy my old setup consumed, and now that the router has died, it is also no longer possible, but I guess that in this case one device consumes less energy than two. If someone has a kWh meter, I will gladly measure the energy consumption. We can than compare and calculate how long it takes before the new router has paid itself back. What would be the impact if all telenet customers (that have internet + digital tv) changed their configuration? How much energy would be saved? I have always wondered how much energy the telenet customer side setup costs in terms of energy. There are so many boxes in my closet, all plugged in, are they really all necessary? Posted in technologie, tinternet.Tagged dd-wrt, digibox, digicorder, energy, green, internet, linksys, network, telenet, vlan, wifi, wrt54g2.